So I was looking around and found your site (really like it). 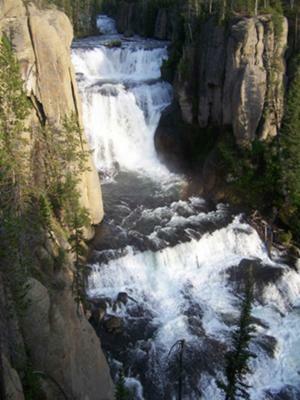 Recently I went on a trip to Yellowstone with a friend and our main goal was to check out waterfalls. We saw many pull-over falls, Union Falls and Terraced Falls. The hike to Terraced Falls was pretty intense. We got about 1/2 way through the hike and ended up in the middle of a thunder/hail storm. We ended up heading back to the car and sitting out the storm. After the storm blew over we hiked back and tried again. Once we made it to the end of the hike my friend started taking pictures of the waterfall (we were disappointed at the poor view). After a few minutes he turned to me and told me he wanted to get to the other side. I went along with his idea and we forded the river above the Upper Terraced Falls. It was a little hairy as the water came up to my hips. We left our shoes and walked barefoot to a good view of the falls on the other side of the canyon. My feet were sore from hiking to Union Falls the day before, but I believe that it was worth the extra trouble to get a good picture. I also think that the parks services should look into making a trail on the other side so that more people have access to the awesome view on the other side.